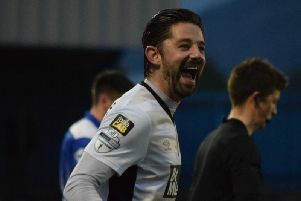 Mark McAllister celebrates his goal against Coleraine. Pic by PressEye Ltd.
Portadown kicked off the New Year with an important win at Coleraine. Mark McAllister’s header right on half time was enough to give Ronnie McFall’s side the points and close the gap on league leaders Linfield to three points. It was a largely forgettable first half with McAllister’s header the only real moment of quality. Things improved after the break as Coleraine upped the ante, but they spurned several good opportunities to draw level. The Bannsiders carved out the first opportunity of the game with only three minutes on the clock as Joe McNeill latched on to Ian Parkhill’s knockdown, the midfielder’s powerful shot though never troubled Billy Brennan. Portadown responded with Mark McAllister almost finding his way through on goal only to be denied by a great tackle from Stephen Douglas on nine minutes. It was a full 25 minutes though before either keeper was called into any real action as Peter McMahon stung Michael Doherty’s hands with a rasping shot from 20 yards out. Coleraine were beginning to find their feet as Gary Browne floated a header wide of the target from Lyndon Kane’s cross on 37 minutes. Three minutes later the Bannsiders carved out the best chance of the game as Browne played in Parkhill, his low cross found McNeill, but his toe poke was blocked by Brennan in the visitors’ goal. The hosts were made to pay for the miss right on half time as Chris Casement’s pin-point centre found Mark McAllister, who headed home from close range. Coleraine were presented with a great opportunity to level things up on 52 minutes as Michael Hegarty sent Parkhill racing clear. The striker’s initial effort was blocked by Brennan, he reacted quickly to pick up the rebound, but again Brennan parried, remarkably the striker had a third opportunity to get a shot away, but his lofted effort sailed over the crossbar. Two minutes later Parkhill was picked out by an excellent McNeill cross, but he headed straight at Brennan. It was all Coleraine now. An awful clearance by Chris Ramsey allowed Parkhill in, his clever flick teed up McNeill, but the midfielder got his shot all wrong and skied over. Michael Doherty had to be alert to push away Darren Murray’s powerful free kick on the hour mark. McNeill and Parkhill combined again on 70 minutes, the striker took McNeill’s cross in his path but his shot was blocked by Breen. At the other end Doherty proved his worth with a good reflex save to deny Murray, who had broke the offside trap with 13 minutes to go. Billy Brennan had to be alert on 82 minutes as Stephen Douglas’ free kick from inside his own half almost caught him out.